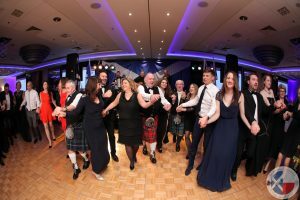 Home Caledonian Ball 2017 Overcome your fear… and reserve your ticket for the Ball! Comedian Graham Norton shows you how to overcome your fear of the kilt! Watch this video and be sure to reserve your seats (we have only a few remaining) for the St Andrew’s Caledonian Charity Ball at the Warsaw Marriott on Saturday 25 November 2017. Guests enjoy the ceilidh dancing! We have a small number of seats remaining for the Ball which will be held in the Warsaw Marriott on Saturday 25 November 2017. At the Ball you’ll enjoy Scottish culture, music, food and dancing while supporting childrens’ charities. If you’d like to know more have a look at photos from last year, or view the Ball programme and reserve your tickets on our web site. welcome reception with a glass of something bubbly! the traditional welcome to our guest of honour, the Haggis! The Ball is Warsaw’s best night out! Don’t miss out – reserve now! Caledonian Ball, ceilidh, Charity Ball, Graham Norton, kilt, Scottish Country Dancing, St Andrew's Ball. Bookmark. Don’t miss out – reserve now!